Tokyo Bay is really big and so considerable time and effort has been spent to get people and goods across the Bay. The biggest effort so far has been the Trans-Tokyo Bay Highway. A 4.4 km long elevated highway carries vehicles into a 9.6 km long tunnel under Tokyo Bay. The project includes a giant ventilator shaft in the middle of Tokyo Bay to supply fresh air to the tunnel. The highway goes from Kawasaki City on the west side of the Bay to Kisaruzu City on the east side of the Bay. 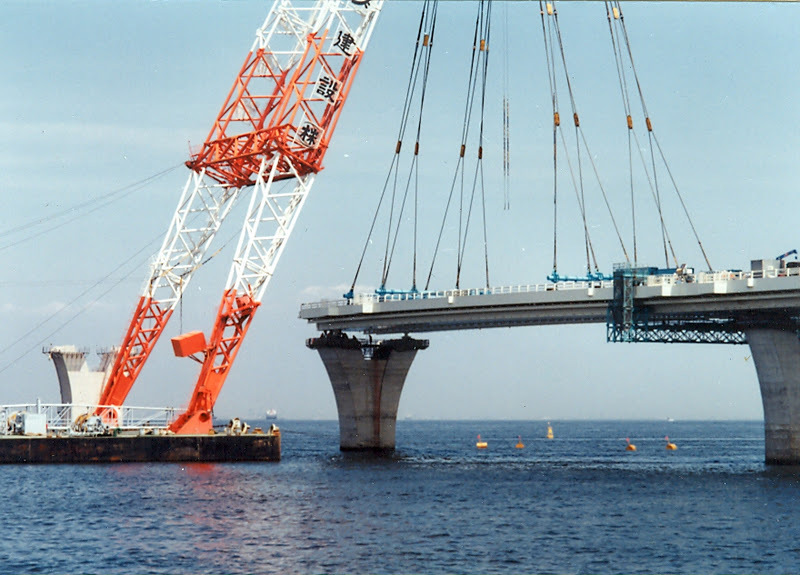 We were taken to visit the project in 1994, a couple of years before it was completed. The steel box girder segments were made continuous after they were set onto the 'Y' shaped piers. Span lengths decreased gradually from the two 240 m center spans. Tokyo Bay Bridges: Aqua-Line Bridge by Mark Yashinsky is licensed under a Creative Commons Attribution-NonCommercial-ShareAlike 3.0 United States License.